Every month we spend an evening scouring the pages of the latest issue of Previews and pick the ten titles we are looking forward to the most. This month it's the October issue of Previews which includes comics scheduled to ship in December 2008. This month also sees a new member, Stewart R, join our previewing team. 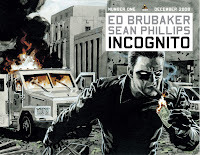 Rob N: No dredging the barrel this month to find new titles of interest, because if the launch of a new comic book by the Sleeper and Criminal creative team of Brubaker and Phillips doesn’t guarantee quality then nothing does. The central concept is a good one – an ex-super villain in a witness protection programme tries to turn his life around, but temptations conspire to drag him back to his old ways. Combining urban crime concepts with super powers is something Brubaker excels at, as witnessed first hand in Sleeper, so it’s hard to see how this can possibly disappoint fans of his earlier work. Certainly a safer investment for your money than in a high-interest paying Icelandic bank account! Matt C: Marvels is one of the classics of the medium, no question, a book that blew everyone’s minds at a time when people were getting way too preoccupied by alternate holographic covers and the like. Can the magic be repeated here, in this long-awaited sequel? Well, I’m confident Busiek can deliver the goods and while Anacleto is no Alex Ross, the preview art does look pretty sumptuous so this is practically a no-brainer: a guaranteed mega-hit and hopefully something that will hold up to repeat readings in the same way the original has. Andy H: It's not the first time around for the Haunted Tank and its latest incarnation brings it rolling into the 21st Century. The spirit of Civil War, General J.E.B Stuart, has helped guide tanks (generally crewed by a descendant) in times of action. It's no different now, and I look forward to how the writer deals with the twist of an old Confederate soldier meeting his African American descendant in modern day Iraq. Stewart R: Perhaps Marvel have had more of a heads up to the current financial crisis than most of the world banks and were inspired to bring us a 1930s, post-Depression era noir world which will remind us all that good things can come out of bad situations. Or perhaps it could just be a dumb-luck coincidence. Either way Marvel's Noir Universe kicks off this December with Peter Parker bringing the good fight to a New York City nestled comfortably in the pocket of the mob. I'm anticipating a darker, grittier feel to the usual Spider-Man story from scribe David Hine. A 1930s interpretation of the usual supporting cast and the limitation on the superpower element could ensure this is a good pulp read. Matt C: One of the joys of going through Previews is that you find stuff you’d miss out completely if you just walked into your Local Comics Shop on a regular basis, scanned the shelves and picked up the same kind of books, unconsciously bypassing anything a bit different or unusual. It was the writing credit of the double-named Wayne Chinsang (aka Justin Shady!) that caught my eye here as he’s currently impressing with the excellent mini The Roberts. The premise is enjoyably kooky (a species who miss boarding Noah’s Ark due to laziness and then do their level best to get aboard) and the art is by a chap named Dwellephant, which is just about the most perfect name for somebody drawing animal characters don’t you think? I’m always up for trying something new, something different, and this fits the bill this month. Andy H: Hellboy has continued to grow in popularity. Generally with mini series of 4 or 5 issues, this volume takes a bigger step with an 8 issue arc. Continuing from events in Hellboy: Darkness Calls, Hellboy travels to England to join the Wild Hunt in search of giants that have risen from their graves. The hunt leads to betrayal and Hellboy finds himself up against enemies as angry about what he is as what he's done. Mignola has kept Hellboy on top form and it will be interesting to see how this longer arc is paced. Rob N: Christmas is coming and no doubt geese everywhere are getting fat. And if you’re putting together a shortlist of books that well meaning relatives can buy you in place of aftershave gift sets or novelty ties, spare a thought for this companion volume to the recently issued Creepy Archives. 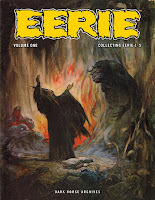 Dark Horse are currently investing heavily in reprinting the classic work of other comic companies, and here they’ve turned their attention to the Warren horror titles of the late Sixties and early Seventies that kept many a fine B&W artist with a Spanish or Philippine sounding name from begging on the streets for spare change. The line-up of artistic talent employed in these non-Comics Code approved titles included the likes of Gray Morrow, Al Wiliamson, Frank Frazetta, Alex Toth, Neal Adams, Joe Orlando, Alex Nino, Alfredo Alcala, and my own personal favourite, Esteban Maroto, who was then to the slinky illustrated female form what Adam Hughes and Frank Cho are today (i.e. very, very good). Where Creepy specialised in one-off short stories with a twist at the end, Eerie preferred an anthology format of continuing serials, combining elements of SF, Fantasy, and of course blood drenched horror. Just the thing to dip into on Christmas Day once the relatives have gone home. Andy H: The zero issue is a great idea and at Avatar they appear to do this a little more often so you can get a feel for a new series without splashing out too much. This time, surprisingly, it's not an Ellis or Ennis book. Christos Gage gets to cut loose instead. Fighting crime seems to be a thankless task and when you try to stay inside the rules it can be too much. John Dusk has done this but he's been pushed too far, locking up criminals just too see them walk free again. Now he must decide where to draw the line, between being a hero and getting the job done. It's not the most original idea but Avatar have a proven track record for a darker and dirtier 'hero'. Stewart R: Eric Shanower continues on the yellow brick road that he knows best and this time Skottie Young (New X-Men) is onboard for the ride. 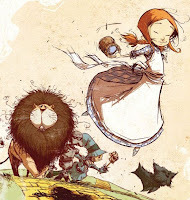 I'll admit that the main draw to this book for me is Young who has crafted and experimented with his work over the past year to produce a characteristic sketch-paint style that should fit the fantastic world of Oz perfectly. The preview art has been impressive so I'm eager to see how this pans out over the 8-issue run and whether the 'wonderful' in the title is truly deserved. Rob N: I confess I had actually forgotten this had been promised as the concluding instalment of the ill-fated Vertigo/Wildstorm series. Since the penultimate issue was published two years ago, that’s hardly surprising really. The Wintermen was a genuine wolf in sheep’s clothing concept, as the initial publicity led fans to expect a Watchmen-esque tale of retired Russian superheroes from the Cold War era. What we got instead was a gripping urban tale of a corrupt modern Russia, scripted with the kind of attention to detail you normally only see in episodes of HBO’s The Wire. Brutal and unforgiving, and boasting a classic issue in which the main characters simply walked around the slum areas of Moscow for a day, alternating shopping and eating Big Macs with dishing out violence, it was a series that drew plenty of critical acclaim, but sold poorly. Finally the story reaches its conclusion, and if like me you followed this title from the start, you’ll be looking forward to this final, long-delayed issue.